When too much time goes by, there is just too much to catch up on. I have been away from the garden twice and written nothing. The first time, I went to London to visit my auntie Rosie in the hospital. She is not, strictly speaking, my aunt; she put it best when she introduced me to a nurse saying, “This is my granddaughter, but I was never married to her grandfather.” It was a short visit, only three days, but a good one, and as always when I visit England, it left me wanting more. One of these days, I guess. My mother was watching Baki and Ali back home, keeping them fed and whatnot, so I had the amazing luxury of being all alone and not having to worry about anything. I also bought a few plants for the garden, including a variegated jasmine, a red leaved grape, a bright red and pink clematis, an amazing ipomea (morning glory relative) with dark purple leaves, and two new herbs for our garden – ginger mint (which really does smell gingery) and French tarragon. I wasn’t going to get it because my friend Maya said she would bring some tarragon from Georgia, but then I noticed that it is an Artemesia (like wormwood), so I got it. Then I learned that there are two types of tarragon, French and Russian, and was glad I had gotten it because I expect that the tarragon in Georgia is Russian. Ali has already taken cuttings of many of the plants that I brought back. 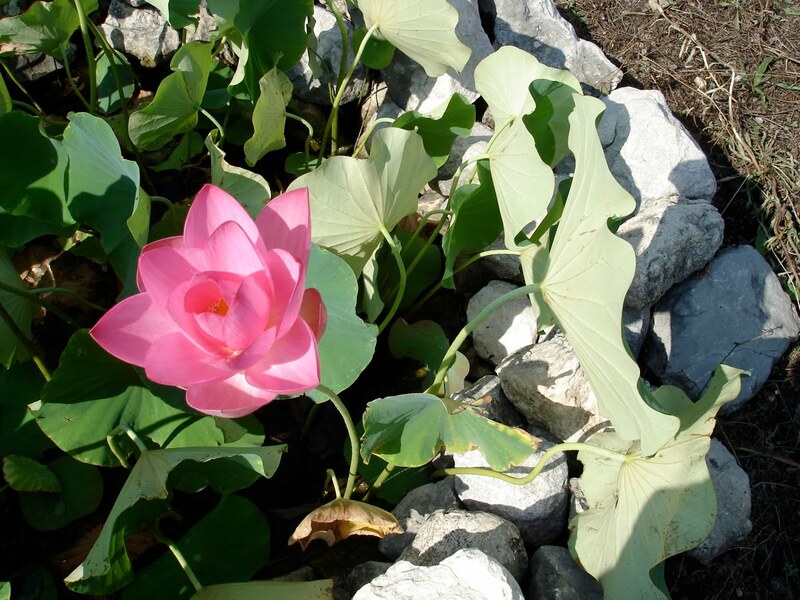 When I returned, our lotus pond had a surprise for me. This pond holds our very first lotus, grown, I believe from a seed we got via mail order from Chiltern seeds. That must have been more than five years ago, yet we never saw a single flower until this year. It was worth the wait, I have to say – a larger, more articulated flower that was not scented like our other, more dependable lotus (which flowered in its first year, also from seed, but I cannot remember where the seed came from – possibly eBay) but was still dramatic. See visual aid. That trip was mid July. Then my mother blasted off for her LA adventure, as she starts the first leg of her trip to her new life in NYC. Baki and I went up to see her off. We all stayed in my house in Istanbul together, which was probably good for the house since we have not had a tenant for a while and it was a bit musty in there. The trip was most notable, unfortunately, for its volcanic explosions, however. Last Thursday, we were out and Baki said he had a stomach ache. I thought he was just hungry, but when we ate, he only picked at his food. Then he said he was very tired. I carried him down Istiklal Caddesi – we were just going to buy a few gifts for my mother to take with her. My arms got tired and I put him down to walk for a while. He went two steps, doubled over, and then vomit started shooting out of him. He felt a little better after that. Still, he had what I think is called a “runny tummy” after that, and there was lots of cleaning up until I got smart and bought some diapers. Was it food poisoning, we wondered? Apparently not. The next day, Baki was feeling better, but was still pretty low key. We took my mom to the airport, then ran around getting bags and seeing people until we ended up at Maya’s restaurant. By this time I was feeling tired out. Maya, her sister and brother in law, all old friends from Georgia, walked us to the overnight bus back to Antalya and saw us off (and I had to remind myself that this was Istanbul 2010, not Tbilisi 1995). By the time we got in the bus, I was feeling pretty awful, until I was certain I would throw up, and hurried off to the bathroom. I didn’t, but I got a few plastic bags together just in case. Good thing – I awoke at 10, and, still half asleep, thrust my head into a bag as a geyser of lunch shot out of me. Thank goodness it was dark and most everyone was asleep, even Baki. And I am especially thankful for buses with bathrooms in them.